The author of Present Shock: When Everything Happens Now and a dozen other bestselling books on media, technology, and culture, including Program or Be Programmed, Media Virus, etc. as well as The Alphabet Effect (1984, 2004), The Sixth Language (2000, 2004), Understanding New Media (2011), What Is Information? (2013), and McLuhan Misunderstood: Setting the Record Straight (2013). “Over 6,000 years of literary civilisation, there have been perhaps 300 million authors: people capable of communicating their opinion beyond their own physical circles. Now, thanks to the Internet, in the historical blink of an eye, the number of authors has reached two billion people. In his new book, Human as Media. The Emancipation of Authorship, the Russian media futurist Andrey Miroshnichenko examines the impact of emancipated authorship on the media, culture, and politics in closed and open societies. Miroshnichenko demonstrates that, becoming themselves the media, people unavoidably engage in the evolution of media activism. For the sake of response and better socialisation, the former audience gets increasingly infected by authorship and inevitably moves from everyday idle talk, to funny cats, then to communal subjects, and finally, to political activities. The conflict between emancipated authorship and the old broadcast media model will stir up antagonisms between developed and developing countries, and will also intensify social and cultural conflicts within developing countries. Andrey Miroshnichenko is a Russian media futurist, journalist, writer and public speaker, PhD, coordinator for the Russian Association of Futurologists, Fulbright-Kennan scholar (2012-2013), and the author of a number of books on linguistics, journalism and communications. He is also a regular contributor to influential Russian media outlets, including Forbes.ru, Slon.ru, The Moscow News, Colta.ru and others. 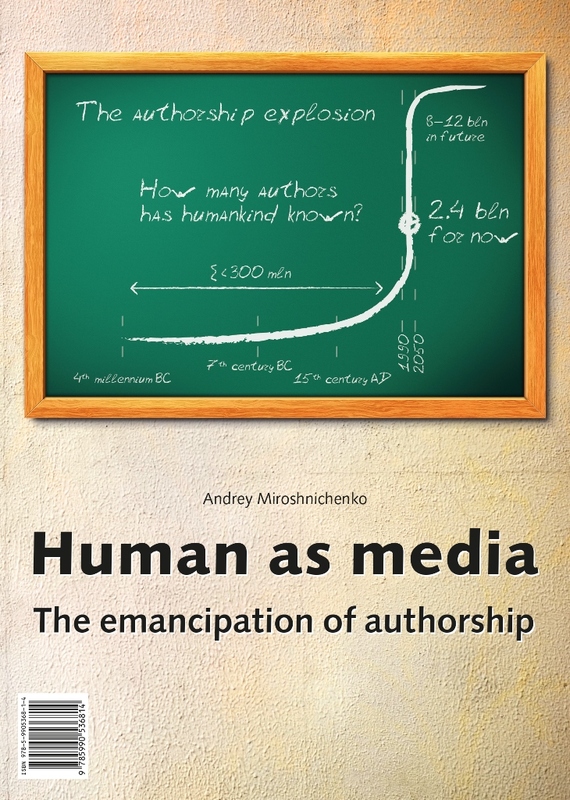 Also, see the review by Robert K. Logan: Review, Precis and Comments Re Andrey Miroshnichenko’s book Man as Media: The Emancipation of Authorship.